Need a gift for that person who has everything? Do you want to honor someone special in your life, or thank someone for helping out? Why not buy a book? The Buy-A-Book campaign benefits the Troy Public Library. 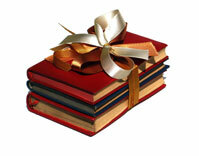 For a gift of $25, a book will be purchased to add to our collection. A bookplate will be placed inside the front cover with your name, or the name of the person you designate, on it. This campaign allows you to contribute directly to the Library’s book collections. As the Library’s membership grows every year, the need to increase its collections out paces the Library’s budget. This is where you can help. Your gift will place books directly into people’s hands: the littlest children who are just learning to read, the teen with an impending book report, or the adult looking for the latest bestseller. Please consider supporting this campaign. You can choose the department you would like your gift to benefit, or your gift will be placed into the general book fund which will be used to fill the greatest need.